Coal is dirty. Coal companies know this—utilities that burn the fossil fuel are willing to spend millions of dollars each year to undermine laws that cut back on coal pollution and protect public health. Vital in this dirty business are the lobbyists who are willing to ignore the massive external costs of coal and make a career peddling the coal industry’s continued grip on U.S. electricity production. In the recent history of the coal lobby, no single person has bought his clients as much delay on critical pollution controls, such as reducing mercury emissions, as Jeffrey R. Holmstead. Currently working out of the Washington, DC headquarters of the lobbying firm Bracewell & Giuliani, Jeff Holmstead has jumped in and out of government positions in a continuous effort to block pollution controls at coal-fired power plants. Holmstead’s coal clients have doled out over $10.7 million dollars (UPDATE June 2017: $23.5 million) to his firm since he joined in 2007, and a primary undertaking of Holmstead’s has been to block and weaken laws that cut back on mercury pollution from power plants. Coal and oil-burning power plants, which release tons of mercury pollution each year [PDF] in the U.S., have avoided any federal mercury protections, despite the Clean Air Act 1990 amendments. This is where Holmstead’s dirty legacy begins. Jeffrey Holmstead’s formative experience manipulating clean air laws began in 1989 as associate counsel to President George H. W. Bush, where he was involved in “the key steps taken to implement” the 1990 Clean Air Act amendments, or as Clean Air Watch’s Frank O’Donnell puts it, he “tried to ‘interpret’ the rules in ways more favorable to industry.” In spite of Holmstead’s role, changes to the Clean Air Act through the 1990 amendments paved the way for requiring mercury controls at power plants and other facilities, but extensive scientific research and coal filibustering stalled EPA’s official endorsement of a strong utility mercury rule for a decade. By December, 2000, EPA finally ruled that it is “appropriate and necessary” to regulate mercury from power plants by installing high-standard technology across the board with a utility maximum achievable control technology rule (MACT) approach (What’s the Utility MACT?). 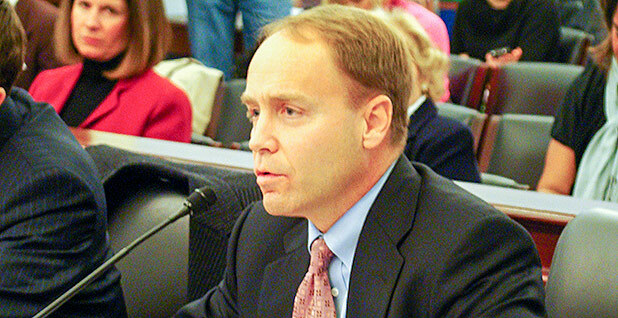 Jeff Holmstead was one of the coal lobby’s voices during the ten year delay leading to EPA’s decision to regulate mercury with a Utility MACT rule. After leaving the Bush Sr. administration in 1993, Holmstead joined Latham & Watkins, a beltway lobby firm. His clients at the time included two utility front groups [PDF]. One of Holmstead’s lobby clients, the Alliance for Constructive Air Policy [PDF] included large coal utilities [PDF] like American Electric Power, Cinergy, Wisconsin Electric and subsidiaries of Dynergy and Dominion. Holmstead remained a lobbyist at Latham & Watkins until 2001. Jeffrey Holmstead put aside his official lobbying job for five years in order to take the opportunity of a lifetime for any polluter apologist. A top position within the George W. Bush administration’s Environmental Protection Agency (EPA) gave Holmstead unprecedented power to reward the industry clients he had been representing. Holmstead’s controversial appointment was blocked by Senators until staff from the Environment and Public Works Committee could review documents to investigate conflict of interest concerns. As a former industry lobbyist, his pending EPA appointment threatened to disrupt the development of Clean Air rules, and undermine ongoing efforts begun under the Clinton EPA to hold polluters accountable for their violations of the Clean Air Act. Sure enough, he dismantled those clean air rules, told Congress it wouldn’t affect the lawsuits despite internal warnings, and watched EPA turn its back on 70 suspected violation cases. One of Holmstead’s priority targets for evisceration was the mercury rule. After years of scientific review, effective and available technology to reduce mercury pollution from power plants, and success in reducing mercury pollution through “maximum achievable control technology” (MACT) rules in other industries [PDF], Holmstead took steps to undo this progress. An EPA-sponsored Utility MACT Working Group composed of 29 experts from the utility industry, state and local air quality offices and environmental groups were confident that a Utility MACT rule, mandated under the Clean Air Act due to mercury’s toxicity, would be EPA’s approach to control mercury emissions from power plants. Instead, Holmstead and his adviser Bill Wehrum stopped the Utility MACT rule in its tracks, disbanding the working group suddenly in April, 2003. The Utility MACT Working Group was never reconvened under the Bush EPA. A few months after the working group was disbanded, the New York Times reported that EPA employees in Holmstead’s department were told “either not to analyze or not to release information about mercury, carbon dioxide and other air pollutants,” in order to be consistent with the Bush Administration’s unscientific political positions. Mercury regulation under the Clear Skies Initiative would have been less effective than the technology-based Utility MACT because cap and trade is designed to bring down geographically widespread emissions of a substance. While this approach can be effective for emissions that don’t have a dangerous local impact (such as carbon dioxide), mercury is known to accumulate locally. Under a cap and trade rule, dirtier power plants would buy credits to release more mercury from plants with lower emissions, and communities around the dirtier facilities could face greater health risks. Concern over these mercury “hot spots” was dismissed by Holmstead, but higher mercury concentrations were later confirmed in a study on the U.S. Atlantic Coast. Additionally, the Associated Press reported that EPA knew of the existence of hot spots in a censored internal report. Holmstead’s reputation for repeatedly censoring inconvenient scientific data and watering down regulatory language was again demonstrated in 2005 by multiple offenses. In March 2005, the Government Accountability Office (GAO) criticized EPA’s lack of transparency in creating a new mercury rule, saying Holmstead’s cap and trade method should have been considered a “last-resort option.” The GAO statements followed an EPA Inspector general report concluding that “agency scientists had been pressured to back the approach preferred by industry” in re-creating mercury regulations. A month later, Holmstead’s office was caught smothering a crucial report commissioned for EPA by the Harvard Center for Risk Assessment as a cost benefit analysis of mercury regulation. The Associated Press revealed how the agency claimed a national benefit of $50 million when the smothered report actually indicated benefits of up to five billion dollars nationwide for larger cuts in emissions, as the Utility MACT rule was poised to do before Holmstead intervened. The Harvard report sat on EPA’s shelf for over a year before AP broke the story. The overwhelming evidence in favor of a strong Utility MACT mercury rule led the Clinton administration EPA to conclude that a cap and trade alternative was not legally supportable. Comparing the favorable and legally-required Utility MACT mercury controls with Holmstead’s cap and trade proposal, the Washington Post’s Eric Pianin explained, “Under the administration’s approach, utilities would have until 2018 to cut [mercury, sulfur dioxide and nitrogen oxide] emissions by 70 percent. By comparison, the EPA working group considered various approaches that would cut mercury pollution by 35 percent to 93 percent within three to four years.” Instead of reducing utility mercury pollution to as low as 5 tons per year in 2008, Holmstead’s plan would only drop emissions to 15 tons annually by 2018. In other words, Holmstead pushed for a ten year delay that ultimately allowed three times the mercury pollution than the Utility MACT he blocked [Heinzerling & Steinzor, p.11]. Jeffrey Holmstead shrugged off the criticism and pushed ahead with his efforts to dismantle effective mercury controls. Holmstead’s office had dragged its feet by vaguely studying both the MACT and cap and trade methods. Lisa Heinzerling explained at the time how EPA “ties itself in knots trying to explain how the law allows it to promulgate either of these diametrically opposed options” [Heinzerling & Steinzor, p.9]. Despite a request from 45 Senators to use the appropriate Utility MACT rule, Holmstead later dropped the method altogether, overstepping EPA Administrator Michael Leavitt. EPA officially issued Holmstead’s mercury rule on March 15, 2005. At this point, certain states and environmental groups sued EPA to force a return to the legally mandated Utility MACT rule. This was achieved three years later in a 2008 DC Circuit Court ruling supporting the Clinton EPA’s December, 2000 decision to reduce mercury air pollution from coal and oil utilities using a MACT rule. The court’s scathing conclusion cited Lewis Carroll’s Alice in Wonderland, stating [PDF] that the Bush EPA’s “explanation deploys the logic of the Queen of Hearts, substituting EPA’s desires for the plain text of section 112(c)(9),” the section of the Clean Air Act requiring MACT controls for power plant mercury emissions. The original Utility MACT rule that Holmstead replaced should have been fully implemented by 2008. As of 2011, EPA expects full implementation by 2016. Accounting for all the delay, Holmstead’s interference has blocked serious reductions in power plant mercury pollution for eight years, assuming no further delays by the coal industry. Unfortunately, that may not be a safe assumption. Since joining Bracewell & Giuliani, Jeff Holmstead has had a total of 16 clients. All but four of those clients were coal utilities, mining companies, or trade associations (and one of those four was CSX, a railroad company that is the largest coal shipper east of the Mississippi). Holmstead’s coal interest clients have paid Bracewell & Giuliani over $13.7 million since he joined the firm. In 2011, only one of Holmstead’s ten clients was not a coal company. With the coal industry’s money, Holmstead and other Bracewell lobbyists fought for the industry’s assumed right to unlimited mercury pollution and resisted other rules to protect Americans from coal industry pollution. A recent MJ Bradley report [PDF] found that eleven of the top fifteen U.S. utility companies have long anticipated recent clean air rules and taken steps to prepare. Two of the four laggard companies were Southern Company and Energy Future Holdings, both current Holmstead clients. Southern Company made two billion dollars last year in profits alone. Southern and other coal utilities invest millions of dollars into subverting regulations. Assistance from Holmstead and other polluter lobbyists at Bracewell & Giuliani costs Southern $120,000 in annual lobbying fees, part of Southern’s $8 million lobbying budget. In addition, Southern is represented by the Electric Reliability Coordinating Council, a coal industry front group run out of Bracewell’s office in Washington, DC. At a November, 2011 meeting with the White House Office of Management and Budget, Holmstead was present with Bracewell lobbyist and ERCC director Scott Segal (who requested the meeting), three representatives of Southern Company, and a lobbyist from Duke Energy. Duke and other major coal utility clients work with Holmstead, his firm and ERCC in the same fashion that Southern Company does. Many of Jeff Holmstead’s current clients were recently named among the top mercury polluters in the coal utility sector, the largest source of mercury pollution in the U.S. Of the 25 companies listed as 2010's biggest mercury polluters (see Environment America report [PDF]), at least 9 are represented by Holmstead. Luminant, a wholly-owned subsidiary of Energy Future Holdings, and Southern Company rank 2nd and 3rd, respectively, releasing over 4,000 pounds of airborn mercury each. Other Holmstead clients on the list are Ameren (#4), GenOn (#7), DTE Energy (#11), Duke Energy (#12), Salt River Project (#20) and Progress Energy (#22). FirstEnergy (ranked #16 in the report), is a suspected member of the Electric Reliability Coordinating Council, or ERCC -- the coal front group managed by coal lobbyists in Bracewell’s DC lobbying office. ERCC itself is a Holmstead lobbying client. Although ERCC refuses to reveal its member companies, several confirmed or suspected members overlap with several of Holmstead clients: Southern Co., Duke Energy, Progress Energy, Energy Future Holdings, and Salt River Project [Drew & Oppel, Jr.]. While working full time for polluters at Bracewell & Giuliani, Jeffrey Holmstead’s statements on mercury’s toxic potency directly contradict some of his statements while at EPA. In office, Holmstead at least acknowledged the danger of mercury from power plants. The Natural Resources Defense Council flagged an unbroken quote from May 2002 Congressional testimony, where Holmstead recognized that “mercury is a potent toxin that causes permanent damage to the brain and nervous system,” that “mercury exposure comes through eating contaminated fish,” and that “power generation is now the largest uncontrolled source of mercury emissions.” In stark contrast, Holmstead claimed in a June, 2011 debate, “It is pretty hard to say that [mercury from coal-fired power plants] is a significant public health issue.” Each year, EPA’s mercury rule is expected to prevent 4,200-11,000 premature deaths, along with thousands of cases of chronic bronchitis, heart attacks, and other health problems [PDF]. It takes a special talent to lobby against public health in favor of corporate profit. Part of Holmstead’s proficiency in peddling coal’s delay and deny strategy is to avoid an honest discussion of the immense impacts the burning coal has on public health and the environment, and instead focus on misleading cost benefit analyses. This dark talent is likely the reason Holmstead was named as one of several George W. Bush administration officials now advising Mitt Romney’s presidential campaign on energy issues. Holmstead also aided Romney during his 2008 campaign. While the focus of this cautionary tale is how Jeff Holmstead has obstructed effective methods of reducing mercury pollution from coal plants, unlimited mercury pollution is only one dangerous privilege that Holmstead has defended for his coal clients. Holmstead’s full history includes parallel efforts to block or weaken other EPA rules. While at EPA, Holmstead attacked New Source Review rules, which require pollution controls when new industrial facilities are built or old ones are upgraded. And as for reducing industry greenhouse gas emissions that fuel global climate change, EPA air chief Holmstead stated in 2005, “the idea that there would be mandatory, you know, carbon regulation is just something that we don’t support.” In his time as a lobbyist at Bracewell & Giuliani, Holmstead was implicated in a 2010 scandal revealing that he and another former Bush EPA official-turned-lobbyist ghostwrote a legislative amendment for Senator Lisa Murkowski (I-AK) that would have undermined the Clean Air Act’s provision to control climate-altering greenhouse gases from major emitters. Sen. Murkowski has received over $380,000 from coal interests from 1999-2011, with $65,000 from Holmstead coal clients in the specific years he has worked for them. In 2011, Sen. Murkowski wrote letters and threatened legislative action to further delay implementation of EPA’s mercury rule. At present, the U.S. Environmental Protection Agency estimates [PDF] that finally completing and implementing a Utility MACT mercury rule will prevent up to 11,000 premature deaths per year, along with other enormous health benefits, by the time the rule is fully implemented. Jeff Holmstead’s sabotage of the rulemaking process at EPA has caused eight years of delay, delay where Americans have continued to suffer from the impacts of pollution from coal fired power plants. The implications of the amount of lives that could have been saved in this eight-year timeframe is staggering: tens of thousands of people have likely been unnecessarily killed by coal pollution because of the delay. Instead of being held accountable, Holmstead continues to make a killing as the coal industry’s mercury lobbyist. The Clinton EPA, recognizing the danger of mercury and certain other hazardous air pollutants, chose the “maximum achievable control technology” (MACT) method for controlling dangerous pollution at power plants. The Utility MACT requires plant-by-plant controls to greatly reduce air emissions of mercury using attainable but top-notch technology. While utilities still haven’t been made to comply with a MACT rule, similar rules for incinerator industries have shown over 95% reductions in mercury pollution [PDF] over a 15-year period. Without any regulation, coal- and oil-burning utilities managed only 10% voluntary reductions of mercury pollution over the same time. Coal and oil burning electric utilities are the top source of manmade mercury pollution in the United States. Lisa Heinzerling & Rena I. Steinzor, Environmental Law Reporter, News & Analysis, “A Perfect Storm: Mercury and the Bush Administration,” part 1 of 2, April, 2004. Lisa Heinzerling & Rena I. Steinzor, Environmental Law Reporter, News & Analysis, "A Perfect Storm: Mercury and the Bush Administration, Part II" part 2 of 2, June, 2004. Neela Banerjee, "Files Detail Debate in E.P.A. on Clean Air," New York Times, March 21, 2002. Katharine Q. Seelye, "White House Rejected a Stronger E.P.A. Alternative to the President's Clear Skies Plan," New York Times, April 28, 2002. Jeffrey R. Holmstead, "Emissions Trading," Letter to the Editor, New York Times, June 7, 2002, obtained through ProQuest. Jennifer 8. Lee, "Committee Approves E.P.A. Nominee, Setting Up Floor Fight," New York Times, October 16, 2003. Jennifer 8. Lee, "Critics Say E.P.A. Won't Analyze Clean Air Proposals Conflicting with President's Policies," New York Times, July 14, 2003. Jennifer 8. Lee, "New Policy on Mercury Pollution Was Rejected by Clinton E.P.A." New York Times, December 16, 2003. Michael Janofsky, "Inspector General Says E.P.A. Rule Aids Polluters," New York Times, October 1, 2004. "Dubious Choices," Editorial, New York Times, April 24, 2006. Eric Pianin, "EPA Announces 'Cap and Trade' Plan to Cut Mercury Pollution; Agency Bowed to Utility Industry Pressure, Critics Charge," Washington Post, p. A35, December 16, 2003. Obtained through ProQuest. Eric Pianin, "EPA Led Mercury Policy Shift: Agency Scuttled Task Force That Advised Tough Approach," Washington Post, p. A17, December 30, 2003. Obtained through LexisNexis. Guy Gugliotta & Eric Pianin, "EPA Withholds Air Pollution Analysis; Senate Plan Found More Effective, Slightly More Costly than Bush Proposal," Washington Post, p. A03, July 1, 2003. Obtained through ProQuest. Guy Gugliotta & Eric Pianin, "EPA Issues Rosier 'Clear Skies' Analysis, Based on New Model; Agency Denies Hiding Data on Rival Bill," Washington Post, p. A06, July 2, 2003. Obtained through ProQuest, available on High Beam. Eric Pianin, "Report Cites 10 States' Mercury Pollution; Envrionmental Advocacy Group Uses EPA Data to Pinpoint 'Hot Spots'," Washington Post, p. A02, December 10, 2003. Obtained through ProQuest, available at Environmental Defense Fund [PDF]. Eric Pianin, "Proposed Mercury Rules Bear Industry Mark; EPA Language Similar to that in Memos from Law Firm Representing Utilities," Washington Post, p. A04, January 31, 2004. Juliet Williams, "List of states suing federal government over mercury regulations rises to 10," Associated Press, April 12, 2005. Obtained through ProQuest. John Heilprin, "Internal EPA study finds higher benefits from curbing mercury pollution," Associated Press, April 29, 2005. Obtained through ProQuest, available through Google News. Frank O'Donnell, Blog for Clean Air, Clean Air Watch. A site search for "Holmstead" reveals numerous accounts over the years. "Resolved: EPA's Utility MACT is the right tool at the right time," filmed debate, Environmental Law Institute, June 7, 2011. Meg Kinnard, "EPA's Holmstead: Emissions Trading Program Works," Insider Interview, National Journal, February 5, 2003. Numerous articles cited in the text were written by Darren Samuelsohn for E&E News (subscription required). Samuelsohn now writes for Politico Pro.